Partitioning your hard drives is always a risky affair. The danger of any interruption like power failure can lead to the whole hard drive becoming unusable. 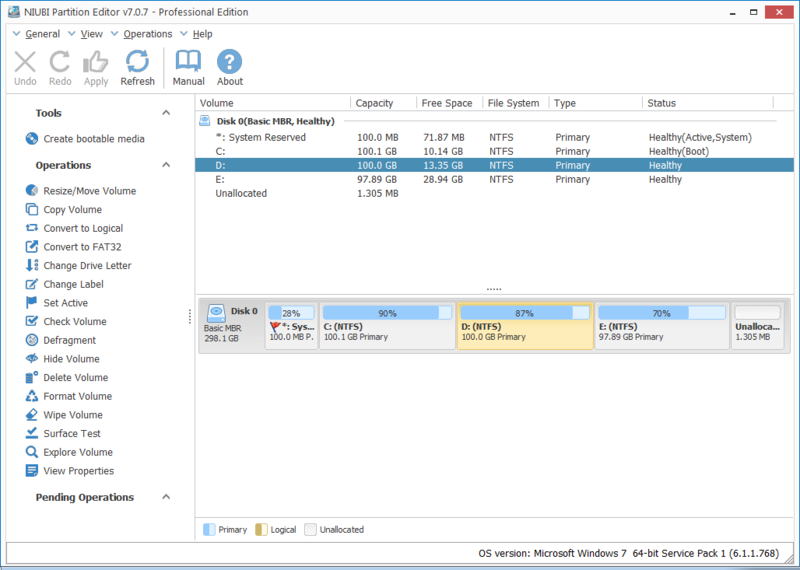 I have reviewed a lot of such partition managers in the past like the EaseUS Partition Master Free 10.5, MiniTool Partition Wizard, Paragon Partition Manager and many other such partition managers. However, recently I have stumbled upon a partition manager that claims to protect our computer drives from such dangers and rollbacks the computer to the previous state within a second. The name of this software is NUIBI Partition Editor. It comes with Built-in Roll-Back Protection technology that claims to rollback the changes you are doing through the software in case of any software or hardware issue within 1 second and with 100% data security. These are tall claims and though they promise a 90-day return warranty, I intend to check out the authenticity of their claims. I got in contact with NUIBI and they were nice enough to give me a key for their professional version of the software. The software is surprisingly very small measuring just 12 MB. There is a single installation for both the free and paid version, with the free version converted to the professional version on entering the key for the product. The difference between the NUIBI free partition manager and professional version is that the free version doesn't offer its unique rollback capability and the ability to create a bootable media. Also, the free version is a little slower in performance compared to the professional version. The home screen of NUIBI Partition Editor shows you all its capabilities in one view. You can see all the drives that are sharing the hard disk space along with the details of how much memory is occupied and how much is free. You also get to see any unallocated space that might be existing on your computer. As you can see, there is a little more than 1 MB of unallocated space present on my computer. Just imagine how cool it would be to take your personal computer OS and applications along with you to work on other computers? You can also use such a media as a backup of your computer when it is in a good state to protect you from my corruption of your OS. 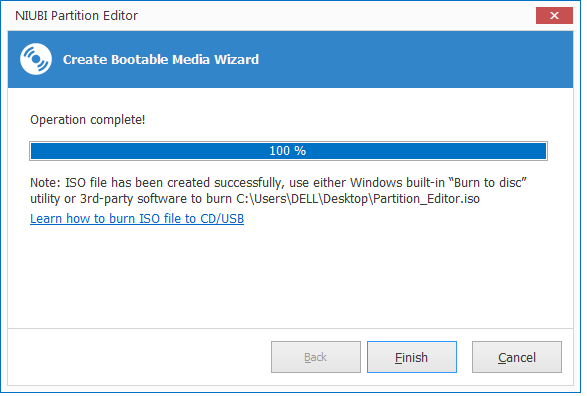 I took a backup of my computer and it took10 minutes to complete the ISO creation process. The .iso file is stored locally on your system and you can then keep it safe on an external hard drive or just burn it to a CD. Usually when buying a brand new PC then partition spaces are not usually to your liking. For example, many people prefer going light on the applications and installing only a few software on their PC. In such a scenario it doesn't make sense to have 100 GB of your hard drive space allocated to the drive having your Windows OS installed. In such a case, tools like NUIBI partition make it simple to reallocate the space. 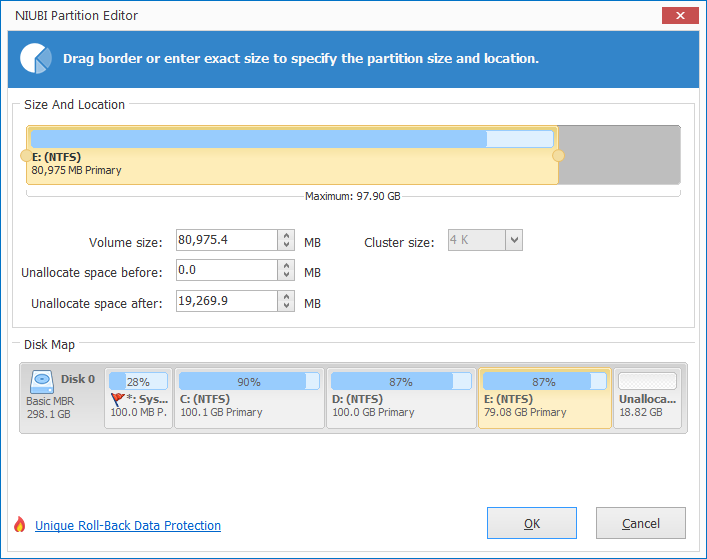 NUIBI partition editor interface allows you to drag and adjust the space you want to deallocate from a hard drive, it is not a big feature but this small focus on details to improve user experience do add up in our user ratings. Like other partition managers, here too you can select the different tasks related to modifying the partition you want to do and they will keep on adding into a queue. Once you have selected all the changes, just click on the Apply button and NUIBI partition editor will start running its magic. Copy Volume: Create an exact copy of one of your drives. This can be over an extended volume from a separate disk with which you can backup a whole partition and migrate it to another computer or just keep as a backup. You can also create a duplicate partition on the same disk though I am not sure what purpose would that serve! However, do note that create a partition and not just copy files. This means that the partition would be formatted first and then the copy would happen. So make sure you don't have any pre-existing files in the partition which you don't want to lose. Convert to Logical/Primary: You can use this feature to convert your primary drives to logical drives. By default, there are 4 primary drives or 3 primary and 1 extended partition on a computer. You can change this by using NUIBI partition editor. The extended drive can be divided into further logical drives if you do require that minute level of partition in your system. Convert to FAT32: Use this option to convert the formatting type of your hard disk. This can be a USB disk you are formatting so that it is readable in older operating systems. Change Drive Letter: Drive letter is required for the Windows to recognize a partition and access it. Remove the drive letter simply makes it invisible to the Windows Explorer. If you want to hide a partition then you can use this option to remove the drive letter or if you want to change the drive letter you can do that too. Set Active: An active drive is the one which contains the boot information. This is the drive which will contain the OS boot processes that will take up the task of loading the OS once the ROM boot processes do the very basic initial loading. It is a good idea not to tinker with this setting if you don't know what it does. Any wrong operation here can lead to your operating system not booting up. Check volumes is a health checker for your computer storage partitions. It will check for bad sectors on the memory and will try to fix those errors. Defragment: Defragmentation is available as a native process in all operating systems and is a method to fix unused but allocated memory spaces on your hard drive. This happens after a large amount of I/O operations which cause the space allocation on the partitions becoming more and more inefficient. The biggest victim of this process in the drive containing the operating system since this is where the average file size is most small and the file count too big as part of the files installed in applications. Consider defragmentation as a clean up activity which makes this space available again back to the OS. Delete Volume: Delete any of the existing partitions on your computer. The space would be transferred to the unallocated storage sector and can be reutilized for create 1 or more partitions. Format Volume: Normal formatting of the hard drive where all your data from the drive will be deleted but the partition will stay. Wipe partition: Wipe partition erases your data from the partition permanently. Data which is commonly deleted can be recovered by the use of recovery software since during deletion, only the memory addresses to the data location are deleted by the actual data needs to be overwritten for it to actually be non-recoverable. For this, you can use the Wipe partition feature of NUIBI partition manager. It will overwrite all the memory locations with 0 or 1 or use other advanced forms of wiping techniques to make all data unrecoverable. 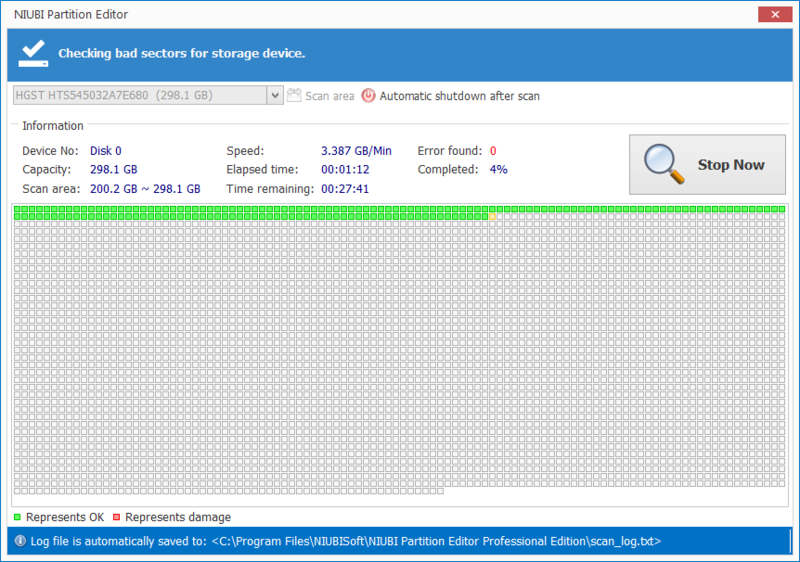 Surface test scans the complete hard drive to check for bad memory sectors and tries to fix them. This is somewhat a extended Check Volume in the way that it checks the whole hard drive. Explore Volume: This launches a File Explorer you can use to view the files on a particular volume. View properties: Check the properties of a volume - heath, status, FS type, Cluster size,Total sectors, Hidden sectors and more. 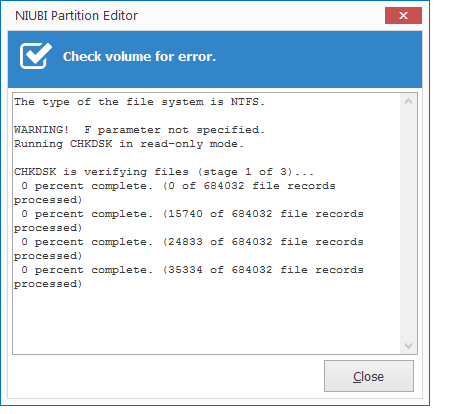 While I was checking out each feature of the tool, I was also doing a crash testing of NIUBI Partition Editor. I started a Resize partition process and when it was at more than 80%, I removed the power cable from the system (no power backup is attached). I tried this at 30% and 50% as well as was able to boot back the system successfully. I tried aborting various operations directly and was able to do those too without having to wait for any process to complete. The software really lives up to its claim. It comes in different price slabs with each focussed on different type of users. For individual users looking at this software for personal use, one copy of the software can be installed on 2 computers meaning that I can use it on both my laptop and PC. I am a happy user of NUIBI partition editor and if you are looking for a similar software, I definitely recommend NUIBI over other competitors. With its 1 second Roll-back feature, it is a partition manager to reckon with. Good general article... not detail oriented. Niubi claims to have 42 MIL subscribers... but they have virtually no Internet presense via Google Search. I would appreciate a detailed comparison of Niubi vs EaseUS + Macrium Reflect 7 + MiniTool Partition Wizard. This would make for a fantastic and useful tech article.